The Radio Flyer Folding Trike, Pink, is an ideal way for little girls to get some exercise and work on those gross motor skills. It comes fully assembled for instant riding fun; it's ready to use, right out of the box. 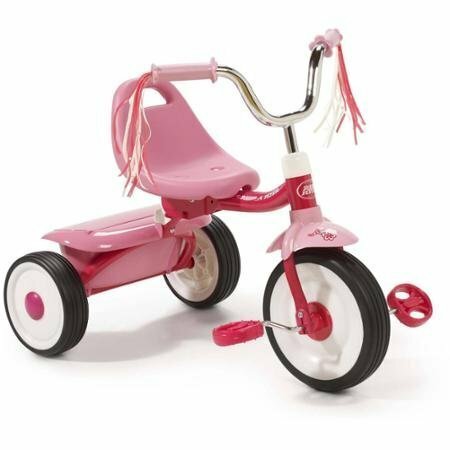 This pink kids' trike is safe for children, offering a controlled turning radius and low center of gravity. This prevents your little tike from toppling over while riding. It has an adjustable seat that grows with your child for longer usage. The Radio Flyer Trike, pink, also folds up for easy portability and storage, making it ideal for taking on trips across town or across the country. The fun streamers on the handlebars add a festive, eye-catching touch that little girls love. This Radio Flyer Folding Trike, Pink, also has a storage bin in the back so they can take their favorite stuffed animals or other toys along for the ride.